Today is Friday! And that means it’s time for a picture book review. If you live or work with young children, there is a word that you probably hear very often. That word is…NO. You will need: Construction paper, paper plate, scissors, markers, glue. 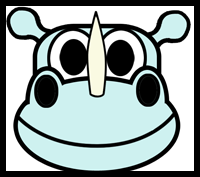 You can go to http://www.artistshelpingchildren.org/rhinoscraftsideasactivitieskids.html and print out the template of the rhino mask. Or you can use a paper plate and cut out the eyes, nostrils, ears and horn from construction paper and glue them on the plate. If you want it to be a mask, you can cut out the center of the eyes. If you are looking for more great picture book suggestions, hop over to Susanna Leonard Hill’s blog where you will find a bunch more hand-picked picture book reviews with activities for you and your child. If you are a mom, teacher or librarian, please check out Susanna’s amazing Perfect Picture Book page with over 1000 categorized picture book reviews and activities. I hope you will be back on MONDAY for a SPECIAL HALLOWEEN POST! I’ll be sharing my entry for Susanna Hill’s Halloweensie Contest (yes, there is still time for you to write a children’s story of 100 words or less) and I’ll also be posting a book review of Barbara Gruener’s What’s Under Your Cape, a marvelous resource for parents and teachers! This entry was posted in Craft for kids, Perfect Picture Book Friday, Picture Book Review and tagged Halloweensie Contest, No! by Tracey Corderoy, Self-control, Stubborness by viviankirkfield. Bookmark the permalink. What a fun book for kids/parents with such a universal topic. Great for young children. This would pair easily with Julia Cook’s book “I Just Don’t Like the Sound of NO!” Love your activities. 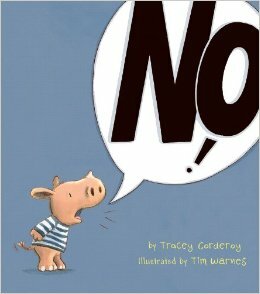 I Just Don’t Like the Sound of No…wow…that book sounds great also. Thanks for the kind words, Pat! Looking forward to reading your Halloweensie tale! I am in awe of anyone who can tell a story in 100 words – I am generally much too verbose for that! That rhino is so cute I wanna squeeze him! Looking forward to Monday! I just started mine thins morning – yikes! Yikes! But knowing you, Julie, you will pull an awesome Halloweensie story out of the hat. Rhino? I’m there. Can you say, favorit animal! Seriously, it sounds like Tracey has hit on pibo gold. Thanks. Terrific for the very young. He looks so cute and naughty! I’m sure this is a book which all children can relate to. And what adorable illustrations! Thanks for sharing, Vivian. I think it is a great book for parents as well…it helps us realize that ALL kids are like this. The illustrations are precious, I agree, Jarm. My grandchildren–now 11 and 10–are too old for this, but I’ve put it on my list anyway. We had a bookcase of “Maybe” books (books they might like to read) and I just have to get this one. They both made the most of the word “No” as they toddled around, and I think it will be a great memory jogger for the family to share “No” stories with the children. What a title! Really catches the eye, doesn’t it? Great message he soon learns. Thanks for sharing, Vivan! Boy! I used to hear that word A LOT!! But not so much anymore. Looks like a cute book. Thanks! I’ve got a little almost-two-year-old I’d love to share this book with! 🙂 Thanks for sharing this at Booknificent Thursday on Mommynificent.com!